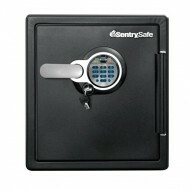 The Sentry SFW123DEB is dual lock safe. 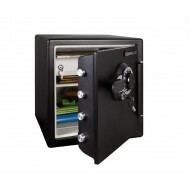 The safe is built with both a combination dial lock and key lock. Both are required to open this fire safe. The SFW123DEB provides multiple protection. 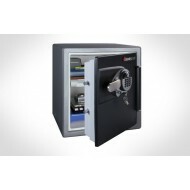 The safe comes with a UL fire rating for documents, an ETL fire rating for media, and ETL water resistant rating and an ETL impact resistance rating. Interior features include a locking drawer, a multi-position shelf, key rack, door tray and door pocket. 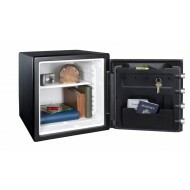 The Sentry Electronic Safe is designed to protect documents, digital media and other valuables from fire, water and theft. It has a one hour UL fire rating for fire protection plus an ETL one hour fire rating - this means the safe is rated to protect both documents and media such as DVDs for one hour in a fire. In addition, this fire safe carries a ETL impact rating which means in a 15 foot fall the fire safe did not break open.